Just to let you know how pleased we were with the apartment. It was comfortable, warm, well equipped and in an excellent location for seeing the sights of Kiev. We were also pleased with the driver you provided to pick us up and take us back to the airport - he is so reliable and punctual. Olga who met us at the apartment and showed us how things worked was a very pleasant person to deal with. Thank you so much Alex for your hospitality and the help you gave us while staying in Kiev; Your apartment was FIRST CLASS in all respects, a true home away from home; You will be the first person that I contact when I arrange my next trip to your beautiful city; Best Regards Austin Cooper, BC, Canada. I hope you had a wonderful time in Croatia as well, while I had the same in Kiev. I just wanted to let you know, that I was fully satisfied with your service. The pick-up from the airport was organized perfectly, the appartment was very nice, well equipped and clean. The location (Michailovsky-lane) was perfect as it was very easy to be in 2 minutes in the centre at Kreshatik. I have to say, I fell in love with Kiev. It's such a nice city. Of course, I know that I see the city as a rich tourist, compared to the people who have to work there. Still, Kiev has so many beautiful things to offer, such as nice walking areas with lots of trees, the hundreds of breath-taking chruches and monastries, the renovated barock-style buildings, and much more. I also was very lucky to arrive on the weekend when there was the 1'500 years celebrations of Kiev, with concerts, fireworks, etc.. Of course, I also was very fortunate with the weather which was hot and beautiful for most of the time (I was so happy to have my aircondition in my sleeping room !). I wanted to thank you and to thank your team for their courtesy and dedication in handling my trip to Kiev over the last two weeks. From the initial contact, I have had no doubt about the professionalism of your service --though one may have some legitimate hesitations in arranging a trip on the net. There has been no surprise and the timing of all has just been perfect. You have answered all the queries I have put through to you, have delivered all the paper documentation such as the invitation letter for the visa on time and there has been no bad surprise regarding the accomodation or other services you are providing. I most of all appreciated the possibility to pay by credit card --whether before to secure the apartment or even upon check-in hence reducing the risks associated with the carrying of large amount of cash. As you know, I had been to Kiev before through other organisations and had paid much more but I cannot say I have been as much satisfied as using your service. I would like to reassure potential customers or people surfing the net. There is no need to do the same mistakes as I did before. It is not because prices are higher on the net at other sites than Alexander's one, whether for accomodation or services, that you will get a better quality service as a customer. Actually, Alexander's service is probably the best quality to price ratio for one who wants to visit Kiev or Ukraine whether for private or professional reasons. Flats are all located centrally in a very nice and convenient area, furnished with style and care and all amenities are as described. There is just no bad surprise. And Alexander and his staff are only a call away, always trying to please the customer. Continue the good work, Alexander, and be sure I will market your service around me and use it again very soon. Thank you. Christian Alain Cuvelier, Paris, France. I recently spent a week in Kiev. The apartments are an excellent value and very comfortable. Alex and his staff handled everything very professionally and reliably, including the arrangement of transportation and registration of my passport. I would definitely recommend Kiev Hotel Service to others planning a trip to Kiev. 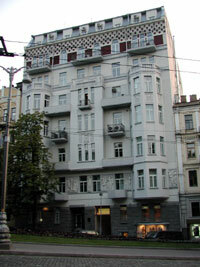 I was recently in Kiev and rented a apartment from Kiev Hotel Apartment Service. The apartment was wonderful, it is very centrally located with plenty of access to shops, restaurants, and markets. The metro is only five minutes away, making transportation very easy and affordable. Taxis are also very easy to get, usually just outside the door. The apartment is very close to many interesting sites, and is located in the Historic District of Kiev, where many of the Embassies are. I found the services provided by Kiev Hotel Apartment Service to be very helpful for a person traveling in the Ukraine. The service provided transportation from the airport and was very helpful in registering my visa, as required by Ukrainian Law. Sincerely, M. Phillips, Seattle, Washington, U.S.A.
Home Kiev apartments Services Booking Faq About Kiev References Guestbook Affiliate Contact us!